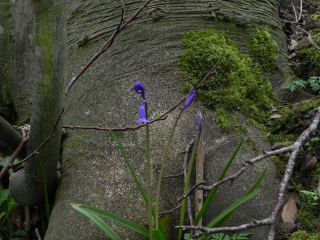 With all the problems we had getting some action from the Blackthorn – many of whom remain unconvinced, or have put out a few tentative flowers – just put out a toe to test the weather – we now have bluebells. Too early! I wasn’t expecting them until the first week in May. Still, I have to say, now the spring flowers have got going they are popping up all over the place. A good thing too. As the hedges and trees come into leaf it is getting harder and harder to see the birds – if it wasn’t for the flowers we would be reduced to taking pictures of sheep, there’s plenty of those around. Speaking of sheep, we came round a corner the other day and there was a sheep, busy munching her way along the (rather narrow) verges. I stopped, unsure what the outcome of our meeting, in the narrow confines of the high hedges, might be – sheep with lambs can be quite aggressive towards dogs – I needn’t have worried, the sheep, after one guilty glance at us hurried off down the road, squeezed between the gate post and the hedge, jumped over the low wall put there to block the gap, ducked under the wires of the fence and through the ‘tunnel’ at the base of the hedge. She then trotted nonchalantly off into the middle of the field. She had obviously used the route before and equally obviously understood that she wasn’t supposed to be out in the road. And they say people act like sheep.